After much work, we've developed an all natural herbal hand sanitizer that does what it's supposed to do. 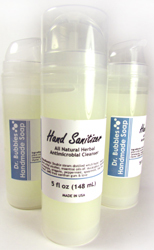 Without resorting to alcohol and all sorts of unspeakable toxic synthetic ingredients, we now offer an all natural, vegan & organic herbal sanitizer that won't dry out your skin while it kills all sorts of germs. While there is no substitute for simple hand washing, this will do what's needed when no washroom is available. Size: 8.0 fl oz (237 mL) in a Skinsana pump dispenser. Now feel your hands. They're powdery soft and dry. Hold up your hands to the light and you'll see that the treatment is evenly distributed on your skin. It's working hard to kill germs and condition your skin at the same time. Magic. Welcome to the new skincare. We hope that you like it. Benefits*: Our organic, all natural hand sanitizer leaves skin silky smooth after it dries. How? Because we invented an entirely new delivery system for lotions and gels. We use aloe vera leaf juice and alcohol free witch hazel, along with other anti-bacterial skin enhancing ingredients as our base instead of alcohol. Add to this an essential oil blend that has been shown scientifically** to kill bacteria, fungi, mold & yeast and you get to enjoy an amazing all natural way to keep your hands germ free while moisturizing your skin. Scent: This citrus-y herbal fragrance is heavenly. *As per FDA requirements: Dr. Bubbles provides ingredient information as a courtesy and makes no efficacy claims whatsoever. ** Kalemba & Junicka (2003). Antibacterial and antifungal properites of essential oils. Current Medical Chemistry (10), 813-829.